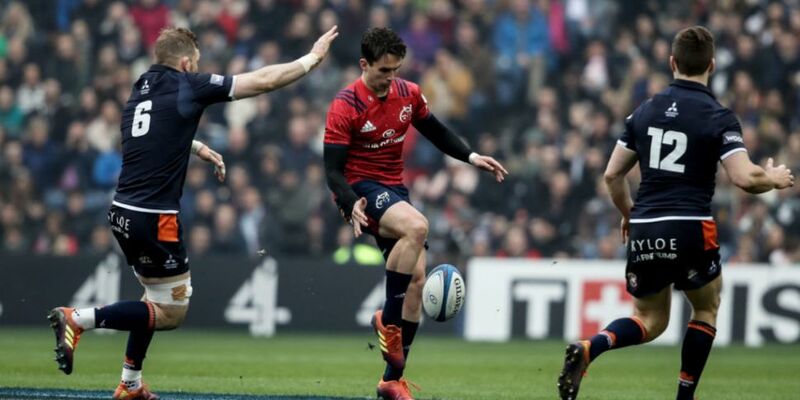 Munster look set to be without the services of dynamic outhalf Joey Carbery for this Saturday's Heineken Champions Cup semi final with Saracens. The 23-year-old has played just 36 minutes of rugby since picking up a hamstring injury for Ireland against Scotland in February, and suffered a recurrence of that injury during Munster's quarter final win against Edinburgh. Last week, Munster head coach Johann van Graan said the outhalf was "highly unlikely" to be fit, and a week on, that position remains unchanged. Van Graan says that while they will give him every chance to prove his fitness, he won't be risked for the game in Coventry if he isn't 100 percent. "We’ll just take it day by day and then make a final call later in the week. Like I said last week, we won’t take any chances with him. If he’s ready, he’s ready. If he’s not, then we won’t take that chance." With Carbery's absence all but confirmed, the number 10 jersey will likely fall into the hands of Tyler Bleyendaal. The New Zealander replaced Carbery off the bench in that win against Edinburgh, kicking a vital touchline conversion to give Munster a four-point lead in the final 10 minutes. The 28-year-old - who has been plagued by neck injuries since arriving in Munster four years ago - looked assured in a starting role the following week, kicking five conversions and a penalty in the province's 45-21 win against Cardiff. Keith Earls has given Munster a timely fitness boost though. The winger returned to full training today, having sat out the recent wins against Cardiff and Benetton as a precaution, due to a tightness in his thigh. Earls scored both tries in the quarter final win against Edinburgh, and now looks on course to re-take his place in the semi-final line-up.